There's a moment in Gravity Ghost where you'll realise much more is going on than you initially appreciated. 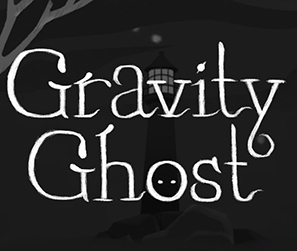 What starts out as a simplistic puzzle-platforming game turns into a charming and sometimes mesmerizing adventure that will keep you hooked through to its conclusion. You set out in search of your fox companion, who has gone missing. Set against a 2d plane, you find yourself in space and able to jump from planet to planet or fly around the surrounding void. Unsure of why you are there, or even where you are, the aim is to seek the guidance of the Guardians. 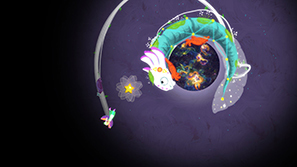 Initially the game's mechanics appear simplistic; you collect the solitary star in the level which opens up the exit and you move on to the next. Each planet has its own gravitational field and while you have some control when zipping across space, you'll need to utilise them to reach your desired destination. 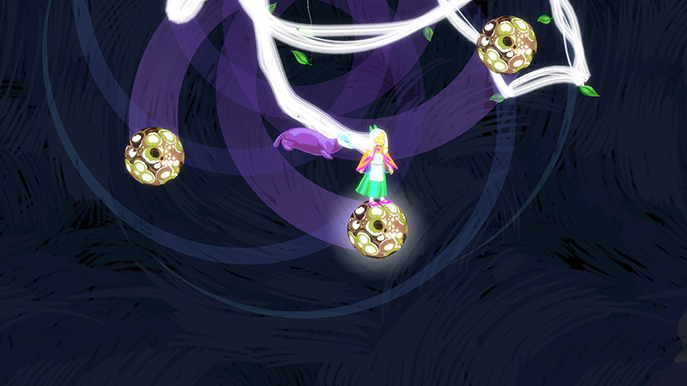 As you progress, each level grows more complex and varied. I was enjoying the atmospheric immersion and calming nature of the game but soon realised that numerous different mechanics that come into play. There are several types of level. Along with the standard type there are mazes in which you guide a ball that's constantly attracted to you to the exit; a new ability is your reward for success. There are solitary puzzles in Guardian levels and various individual sections. 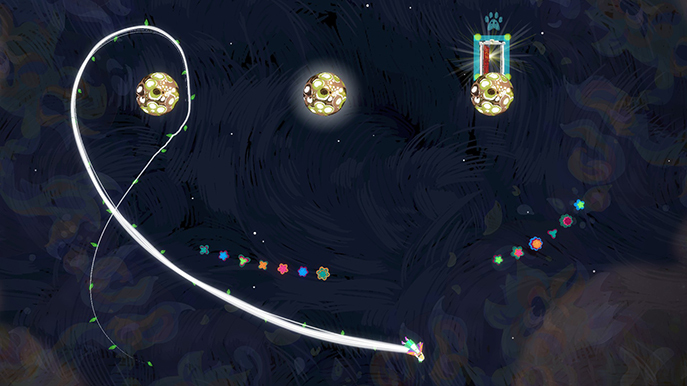 You gain abilities such as gliding and plummeting among others which greatly help you manoeuvre around the levels. The presentation throughout Gravity Ghost is outstanding in all areas. The gorgeous, colourful planets on the background of space differentiate well and the various animals and places you see look fantastic. The visual effects of your actions are lovely as well. This is all paired with a wonderful soundtrack from Ben Prunty (FTL). I felt the audio could be described as a cross between Faster Than Light and Thomas Was Alone. 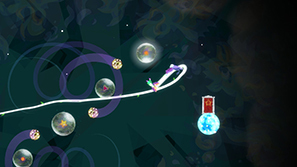 The music plays continuously as you progress through levels helping it all feel seamless. There are a few levels when everything comes together at just the right time and I was in awe. As you get deeper into the game new planet types are introduced. The standard planet's gravitational field will affect you but other than that it does nothing. There are ice planets causing you to slide round and round, bouncy planets which launch you back up upon contact and glass planets which will shatter if you fly into them at a great enough speed. There are a good number of other planets as well. Each has their own unique feature and does a great job of keeping the levels feeling fresh and varied. That is something Gravity Ghost does particularly well; it keeps introducing you to new mechanics, abilities and planet types as you play. One will stay long enough for you to become accustomed with how they work but another will be introduced before long. The pace works very well and constantly felt that the game got more complex as I was getting more skilled at it. There are a slew of abilities. As well as the personal abilities you receive from completing the maze challenge levels you acquire the ability to terraform planets. For example; if the star is in the centre of a solid planet you could terraform it to a water planet and swim to get the star. Terraforming uses up your hair, which you increase in length by picking up collectables. 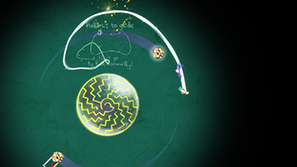 One criticism of the game is that it lacks any real challenge. I found myself progressing smoothly and without getting particularly stuck at any point. While this is a criticism, I didn't mind too much. I was so immersed in the atmosphere that I immensely enjoyed my time with it. There was one point right at the end of the game that I struggled to get past but once I stumbled upon the solution I realised it was an obvious one. In fact, I was overthinking it. It is solved without using any ability and I was cycling through powers and trying each one. I did look to see if anyone else had been stumped by this but couldn't see any. I'll chalk it down as my own error. Upon solving that puzzle, the ending sequence began. The narrative throughout the game is strong and is displayed through cut-scenes boasting more wonderful art. As you progress these scenes reveal more about Iona and her family and friends; uncovering a deep and affecting narrative that I wasn't anticipating. At two to three hours the game doesn't last that long but utilises that as a strength. Every aspect of the game is so focused and refined those hours pass quickly. The involving story, the ever evolving level type and the wonderful visuals and audio make Gravity Ghost feel like a great adventure from start to finish. 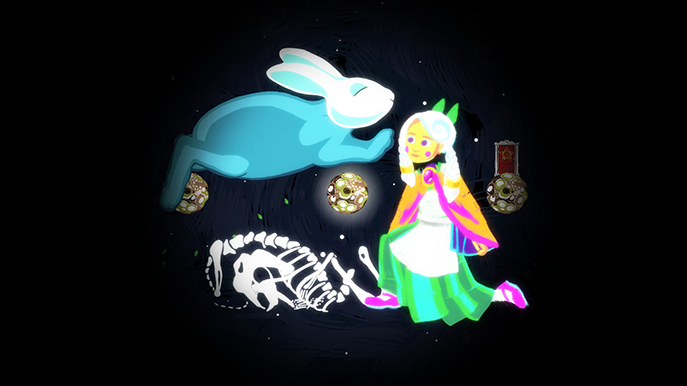 Gravity Ghost was a real joy to play through and a game that I'll definitely revisit. The soundtrack will have a place in my collection as well. If you haven't played it yet, remedy that now!